While it will take a number of changes to keep our planet habitable for humans for generations to come, transportation continues to play a substantial role in the climate change reduction equation. Around the world, transportation accounts for approximately 60 percent of global oil consumption, 27 percent of energy use and 23 percent of CO2 emissions. However, your parking garage might be one of the many underutilized solutions to the rising tide of transportation-related climate change. Transportation’s greenhouse gas emissions are rising faster than any other sector. As the world urbanizes, this trend is expected to accelerate. To help bend this curve at its very source, Parksmart, administered by GBCI, helps owners focus on the climate impact of how they provide access to their offices, shops, venues, airports, campuses and other destinations. Bank of America Plaza, Brookfield, Los Angeles. Electric vehicle charging station. Using Parksmart helps both new and existing parking assets do more good. It leverages the parking supporting your building—be it attached, underneath, freestanding, or a podium—to keep air and water cleaner and to accelerate our transition to more sustainable forms of mobility. Your facility can do all this while reducing operating costs and increasing performance. Parksmart’s credits encourage the use of idle reduction technologies like wayfinding systems and access control equipment to reduce auto emissions. The rating system celebrates the installation of high-performance, energy-efficient lighting and ventilation solutions to cut energy use, recognizing programs that promote walking, carpooling, biking, use of mass transit and electric vehicles. In addition, Parksmart helps managers take a fresh look at parking asset and operation, inspiring them to make improvements toward more sustainable mobility. Parksmart-certified projects like the Silver Spring Metro Plaza demonstrate how Parksmart encourages sustainable parking and transportation practices, such as incorporating bike rooms, asking participants not to smoke inside the facility and encouraging tenants to turn off the lights. Bicycle parking. Photo credit Dero. How people access buildings of all types is changing more rapidly than ever before. 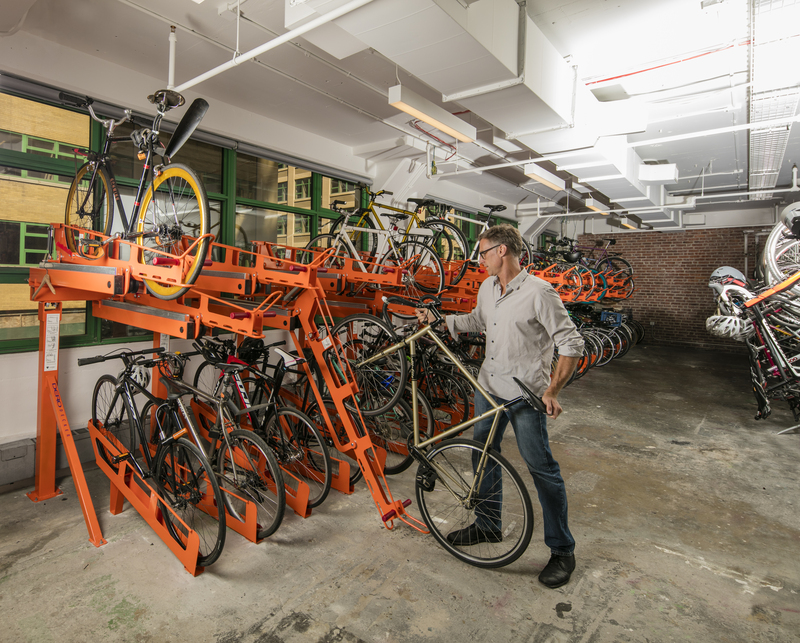 Between ride hailing, autonomous vehicles, congestion pricing, adaptive reuse and the growth of bus rapid transit, today’s parking asset must evolve to keep up with tomorrow’s demands. Parksmart helps position businesses to gain continued value from their parking garages while encouraging the most sustainable forms of access. Contact us to learn more about how Parksmart can help your parking assets grow in a smart way.